Sister, sister! Brooke Boomer and Sarah Nelson are two sisters who started The Ruby Tap to bring together the things they love most: family, friends and wine! This darling wine bar with two locations (Wauwatosa and Mequon) offers wine on tap, self-service wine machines, beer, charcuterie and cheeses (it's Wisconsin after all). Sign me up! This rad pizza joint started by Marissa Lange serves up some some hearty slices of 'za, catering to all your dietary needs (lots of gluten-free and vegan options). Their pizza names are worth a menu gaze alone - such as the "I'm Feta Up!!!" and the "Anne Curry." Speaking of Ann Curry, is anyone else still upset about the Ann Curry/Matt Lauer debacle? Just me? Let's have a slice in her honor. Milwaukee designer, proud Scandinavian, idealist and storyteller, Teresa Olson is the woman behind the beautiful home goods store in the Shorewood neighborhood. Not only is Teresa improving surroundings by providing local and Scandinavian-sourced home decor, artwork and sustainable building products, she also offers her services to help make your interior design dreams a reality. A great space to pick up a gift for yourself or others! Visiting Milwaukee will almost certainly include a stroll along the Riverwalk. When hunger hits, make sure to check out Wolf Peach, just off the Riverwalk in the Brewer's Hill neighborhood. Owner Gina Gruenewald creates a rustic European atmosphere and menu worth a visit! Looking for a tour of Milwaukee? 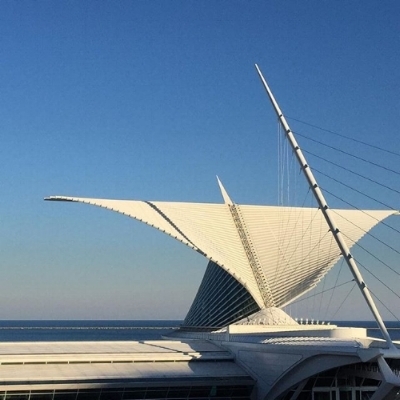 We suggest Milwaukee Food & City Tours. They offer many different types of tours, including private tours. This is a woman-owned business and owner Theresa Nemetz would be jazzed to have you on one of her tours! What about a ghost tour? Try Anna Lardinois' tour company Gothic Milwaukee. We hear the tours are spook-tacular!